A bit more info re the Metro Turbo series. An Austin Rover information sheet (Racecard) that announced the change to Turbo power and the accompanying body kit. Also added a qualifying sheet from a European Championship round in 1988 that gives many names from the series. Although wasn't there another David Llewellyn to the rally star during the period? I can remember Steve Parrish running in the 1986 series too, my brother Dave Carvell was asked to take him round the circuit for a few laps during the lunch break to show him the lines ! !, he used Richard Potter's TWR XJS road car for the task. Have added my favourite photo from the '86 season. Y'know, in the first race I did in a Metro at Donington I did exactly the same thing coming into Gerrards. The CoC suggested I was "over exuberant". The photographers suggested it was just one wheel less than normal. Peter, for two reasons I think you may be mistaken here. 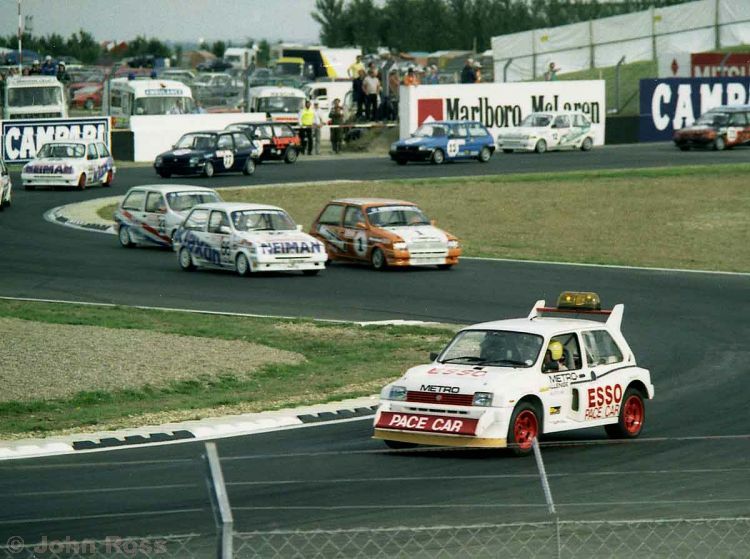 Firstly, if your race was at Donington and you did that coming into Gerards you must have been using the very long circuit layout which also involves the M1 as Gerards is at Mallory Park! Secondly, if your race was at Mallory & you did do that on the way into Gerards, I suspect you would have rolled quite spectacularly into the sleepers! I always thought Gerald's was the chicane. But yes Goddards. Isn't Goddards the hairpin leading onto the main straight?